How Do You Find the Mode of a Data Set Where All The Numbers are Different? To find the mode of a data set, look for the number that occurs most often. What if all the numbers occur the same number of times? What's the mode of that data set? This tutorial will tell you! How Do You Put Whole Numbers in Order From Least to Greatest? Ordering large numbers can be tricky, but a place value chart can make the process easier. This tutorial shows you how to use a place value chart to put large numbers in order! How Do You Find the Mode of a Data Set? The mode of a data set is the number that occurs most frequently in the set. 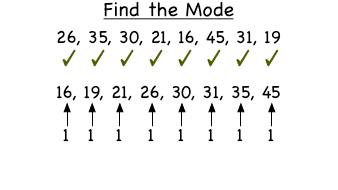 To easily find the mode, put the numbers in order from least to greatest and count how many times each number occurs. The number that occurs the most is the mode! Follow along with this tutorial and see how to find the mode of a set of data. How Do You Find the Mode of a Data Set When There is More Than One Mode? The mode of a data set is the number that occurs most often, but what if your data set has more than one mode? Is that possible? This tutorial explains what to do when a data set has multiple modes!